Melissa Ramsden heads up a team of talented designers who live and breathe events. The team brings fresh, creative, unique ideas, sparkles, flair and endless passion to everything they do. Ever since I was a little girl I have loved parties. I remember spending hours on end flicking through the women’s weekly cake book and carefully selecting the cake that would be the centrepiece of my next birthday. My mum and dad were always given strict instructions as to how my parties were to look, run and be delivered. When I was 8, my passion for backyard discos continued into an obsession for weddings, and after watching “the wedding planner”, my wedding magazine pile continued to get out of control and my wedding scrap books began to burst at the seams – and so the dream was born. 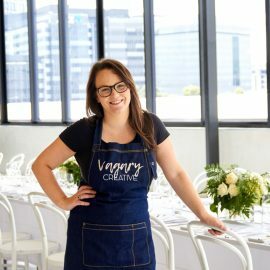 After studying Visual Merchandising at RMIT, I worked as a full time event stylist with The Design Depot/The Big Group for 5 years, gaining a world of experience under the best of the best. Now residing in a barn in the Yarra Valley, my passion for delivering exceptional events continues today. I believe that life’s events should be celebrated in a big way; and work with you to deliver events you’ll remember forever. Whether it be an engagement party, wedding, birthday, bat mitzvah or a corporate affair, I work with you from day one through to delivery to ensure your event is a reflection of your personal style and theme, ensuring that when you look back on life’s biggest moments, they are just as stylish as they are special. Beautiful events are my life’s passion, so let me make yours a reality.